Valentines day is just under a month away.. and while C & I are not big "Valentines day" celebrators... and have vowed not to do gifts this year in lieu of things for the house, and wedding plans.. 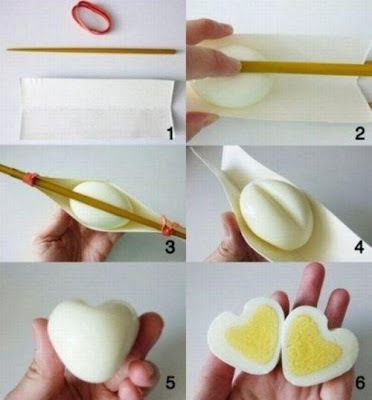 I thought the heart shaped eggs were a great idea to pack in your significant others lunch box, or serve as deviled eggs at a Valentines day party.. I will be making these. and will be sure to update with photos of how they turn out..
Who doesn't love heart shaped food, right? 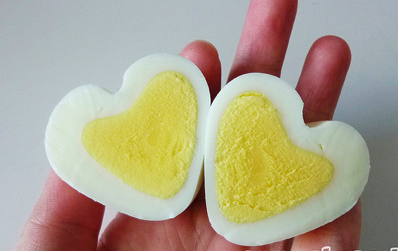 Here's simple how-to make a heart-shaped hard boiled egg via Anna The Red. This would be such a cute addition to a home packed lunch this Valentines.. Cute! It would make a cute deviled egg too, which my bf loves!! yes.. C totally loves them.. so this is a must! Can't wait to hear how it goes with the BF!